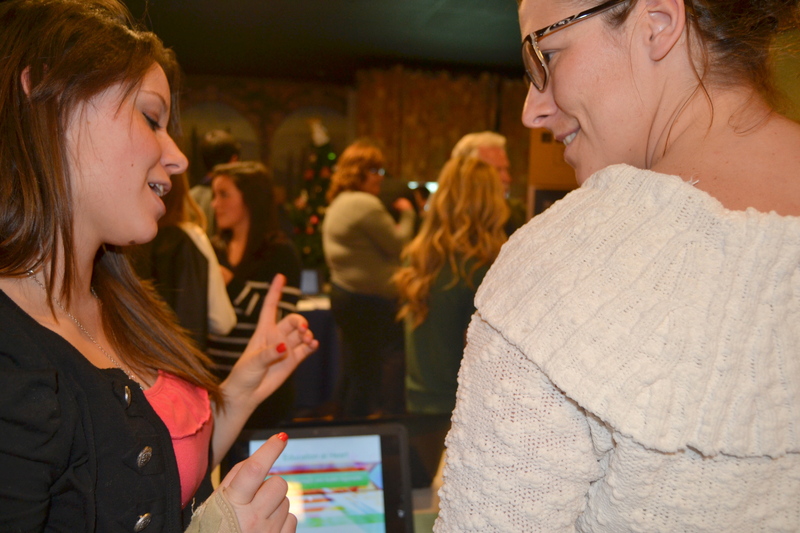 Senior Kyra Odenbach discusses her RIA project with Ms. Slavnic at last year’s ReCon. Research in Action is one of the most heavily weighted classes at the Academy, but that doesn’t mean that scholars cannot have a little fun with it. Students of all ages have come up with some inventive and elaborate ideas to research in the non-structured classes. The self-directed class meets once a week, and scholars choose projects to delve into over the course of a semester or year. The student body has proven that sometimes the most creative ideas can come from the most obscure of places. A group in Mr. Hostetler’s RIA period is planning to build a Thorium reactor. The group consists of freshmen Luke Sanchez, Jacob Goeldner, and Brennen Buchanan. They want it to be constructed as a breeder reactor, which generates both a supply of electric power and fuel that can be used to continuously power the reactor itself. Thorium, a radioactive metal, can easily be acquired without being too expensive, so it was the perfect material for the group to use. “We wanted to find a cheaper way to create energy besides combustion, and Thorium is comparatively cheap,” Sanchez said. Although they are not entirely sure on how to test their powerful creation, the group is confident that their reactor will become a reality. Next door, in Mr. Gullett’s RIA, juniors Josh Tapia, Christopher Lucero, and David Senteno, work on a theory that music can have an effect on how well certain individuals learn and work. “We decided the best way to test it would be to have categories of people from liking music to hating music, play them music while they do something, and record how they do,” Lucero said. Like the Thorium reactor group, they have yet to figure out all of the minute details of how their experiment will function. They have conducted their interviews, and found that “past life events do not affect music choice and preference,”Lucero said. The results therefore disprove their hypothesis. Next is sophomore Chris Cordova, working on a solo project. He is designing a new form of rifle scope, one that can “Calculate the ballistics and tell you where to aim your scope and hit your target.” He was inspired to make this scope by the video game “Sniper Elite V2,” which contained a similar, fictional scope. He plans to test the scope by attaching it to a rifle, test it at a firing range, and then compare it with a regular scope on the same rifle. So far, he has a few base designs, but nothing entirely concrete. Sophomores Nathan Cordick and Mason Kemitz are designing a pzoElectric keyboard, or a “key board that that powers the computer while you type with kinetic energy.” They say that their project is fairly groundbreaking in the field of pzoElectric energy, using a combination of techniques and “adding a new level of efficiency.” The group is currently working on their third prototype for the project, and is planning to make a usable version in the near future, with this model predicted to be the most energy efficient so far. ReCon will be held this Thursday at 4 p.m., at the Italian American Club and the Elks Club. The public is encouraged to come and view or judge the presentations.